Led by Artistic Director Melanie Cortier, Eidolon Ballet is a chamber-sized contemporary ballet company created in 1999 with a reputation for developing accessible, unorthodox, and fun-loving forms of dance. Eidolon contrasts ballet and modern dance with ethnic, modern, and classical music, creating a universal dance experience. 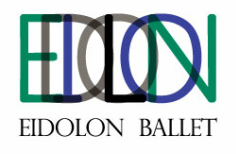 Eidolon Ballet In Concert, established in 1999, was incorporated in 2002 and received its 501 (c) (3) status in 2003. Founded by three freelance dancers who shared a dream to build an off-season ballet company for professional dancers who were interested in reviving a valuable practice from the past, in which ballet directors gathered composers and musicians, choreographers and dancers, painters and designers together to create new and often unorthodox works. Following in the footsteps of this unity-in-diversity tradition, Eidolon provides seasoned dancers with an opportunity to explore ways to collaborate with colleagues and experiment with innovative ideas while continuing to hone their craft. The company serves as a dynamic center for fledgling artists as well as for dancers who are seeking an alternate secondary route for their careers. They all have a strong commitment to dance and are dedicated to realizing their full potential in the performing arts. Additionally, some of them are motivated to becoming educators. Others are interested in learning the principles of choreography, costume, set, sound and lighting design, and stage management and publicity – knowledge that is essential for pursuing a different career path in dance or the theater. As a way to accommodate the needs of dancers who require a nurturing environment to be able to express their artistic ideas freely and allow for a close and personal interaction between company members, Eidolon maintains a small scale so as to avoid a sense of intimidation that could result from a larger and more impersonal setting. The work of its artists ranges from studio performances, children’s performances and small theatre presentations to those that can be staged in a large theatre with an orchestra. The company provides a testing ground for the creation of ballets where a gifted choreographer is provided with a setting for the performance of a new work. In this connection, Eidolon is a strong supporter of new and innovative works. Eidolon also supports the professional growth of its members by fostering the development of non-performance skills. Company members are given the opportunity to apprentice with dance and theatrical professionals in all phases of performance and management and are invited to mentor new dancers who have joined the company. Eidolon’s vision demonstrates how a dynamic combination of music and choreography can be heightened by a fusion of multicultural elements in creating work with a strong appeal to the diverse segments of our society. Eidolon’s programs are eclectic; they aesthetically link ballet to modern dance, drumming, tap, jazz and punk challenging audiences with new, innovative dances that, while rooted in the past, can be reconfigured and fused with contemporary motifs. Our concerts challenge popular conceptions of contemporary ballet, taking it to the next level and leaving our audiences entertained. The founders recognized the need for a medium that would allow artists to explore new ideas, spearhead avant-garde works and have a venue in which their works could be performed. Located in New York City, the company is dedicated to making dance more accessible to the community at large, fostering an environment that encourages artists to fuse their multifaceted legacy and stylistic concepts into exciting projects. Dancers are able to witness the results of their various efforts by bringing the magic of ballet to audiences in works designed to have a strong mass appeal. In addition to furthering their training in dance, the artists are taught the fundamentals of administration, management principles, technical production and ways to synthesize the overall artistic vision of choreographers, dancers and other key artists. As dancers progress through their careers, they often have to decide the direction to choose for the next step in their professional lives. Eidolon’s focus on the various aspects of the performing arts enables them to develop a greater level of professional grounding and versatility, resulting in the formation of a generation of self-sufficient dancers who possess the requisite skills to work for a dance company or theatrical company as a manager, technical advisor or even start their own company. Ei-do-lon [EYE-doh-lawn] n. an ideal image.